Magic truffles are a type of mushroom that grows beneath the ground and are better known for their hallucinogenic and psychedelic effects. Magic truffles contain the substances psilocin and psilocybin, which causes these effects. These are the same substances that are in magic mushrooms. 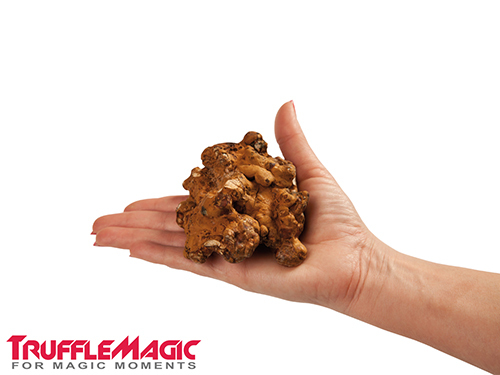 The largest difference is that magic truffles grow beneath the surface and that magic mushrooms grow aboveground. 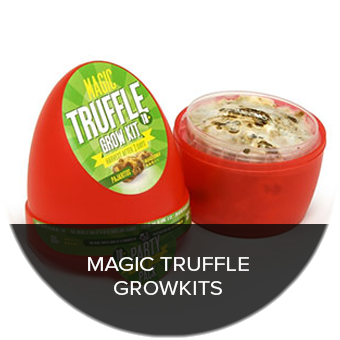 The official name for the magic truffle is Sclerotium. They are also known under the name “trip tubers” or “Philosopher’s Stones”. A new world opens before your eyes you when you take magic truffles. You go to places that you’ve never been before and see things that others can’t. For many people, the effects are therapeutic. I personally believe the world would be a different place if everybody took magic truffles a few times a year. For new users, it is important to know what type of truffle you should take and how much of it you should take. The situation in which you take the truffles and your mood are also important. In this article, I will tell you everything you need to know about magic truffles, their use and a little bit about the history of magic truffles. Pay particular notice to the links in this article, because they go deeper into particular topics. Magic truffles aren’t actually mushrooms, but a very special finding of the fungus to survive difficult times. If the aboveground circumstances are so bad that the mushroom could not survive, the fungus can’t reproduce, since the mushrooms cannot produce the spores that are necessary for reproduction. For these situations, Mother Nature gave the fungus the possibility of growing its fruits below ground. The hypha clout together and form a buffer for water and nutrients, allowing the fungus to survive. Not all fungus species are capable of doing this, but luckily there are plenty that do and contain the psychoactive substances psilocybin and psilocin. It is very difficult to grow these truffles, but thanks to our collaboration with the oldest truffle growers in the Netherlands, we are able to grow the best truffles in the world! 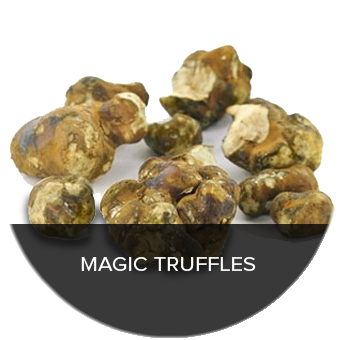 Would you like to know more about the types of magic truffles there are and how we grow our truffles? 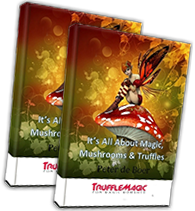 Download my free e-book about truffles and magic mushrooms through this link. Some people confuse magic truffles with magic mushrooms, but they are two different types of products. From a biological perspective, “a survival mechanism of a growing fungus” is the most accurate description of a truffle. A fungus can grow into a mushroom, but if the mycelium of the fungus does not get enough oxygen or doesn’t have the correct soil to survive in, then under the right circumstances, a fungus fruiting body can develop that grows underground. We call this sclerotia or truffle. Truffles, therefore, are the underground product of different species of mushrooms. Both hallucinogenic mushrooms and truffles contain the psychoactive substances psilocin, psilocybin, baeocystin and norbaeocystin. Both are funguses, but not in the same form. There are stories that magic truffles are weaker than magic mushrooms. This isn’t always the case, so beware. A mushroom grows in different phases. The last phase is the most potent, but is not equally potent for all mushrooms. Truffles of the same species are all roughly the same strength, and for that reason they are much easier to dose and, therefore, safer to consume. I have had amazing experiences on both magic mushrooms and truffles, and they are quite similar in terms of experience. The difference between magic mushrooms and magic truffles is minute in my opinion. A psilocybin trip is a highly personal experience that is different for everyone. For me, it is always a question of the dose and, of course, the set and setting. Taking magic truffles leads to an entirely different level of sensual perception and often also causes hallucinations. You start seeing colours and patterns, you are more sensitive to light, and you experience everything far more intensely. Drinking a cup of warm tea or eating a sweet strawberry can be a tremendously intense experience while under their influence. Magic truffles are also often used for their therapeutic effect. Many people arrive at a certain level in their consciousness that they are usually unable to reach. This helps them gain insights that make them happier people and change their lives for the better. Magic truffles contain the same psychoactive substances as magic mushrooms, and, consequently, have the same effects. Just like with magic mushrooms, some truffles are stronger than others, but the effect is the same; a lovely trip in which you experience more special things than the average person does in a year! A lot of research has been done into the effect of psilocin and psilocybin that you can use to your advantage. Read my article, the effects of psilocin and psilocybin, for more information. Erowid once said: “Determining the right quantity of magic truffles can make the difference between a positive and a negative experience”. As a regular user, I know this to be true. A dose that is too low can cause irritation and discomfort, like having too much coffee before bed. A dose which is too high is much more unpleasant, can be frightening and can even cause a bad trip. Everybody responds to truffles and magic mushrooms differently, so it’s important to find out what is pleasant for you. If you don’t have a lot of experience with psychedelics, I advise you to take less. This way, you can avoid an unpleasant experience. I am confident that most people will have a lovely trip if they take 15 grams of fresh truffles. But, if you’re taking it for the first time, I recommend taking half a portion (7.5 g) to find out how you respond to it. Read more in my article dosing magic truffles for more information on determining the correct quantity. When we started growing truffles 10 years ago, the taste of the magic truffle wasn’t great. This was mostly because the truffles had a growing period of four months, as a result of which they contained a lot of moisture and tasted acidic. Today, we have been able to extend the growing period to one year; the truffles now contain more sugar and are tastier. You can eat the truffles, allowing you to taste them well. When eating truffles for the first time, you will have to get used to the taste. They taste a little nutty, bitter, with a hint of butter. You could compare it to the taste of walnuts. By chewing properly, you achieve the maximum effects, which will be noticeable within 15 to 60 minutes. 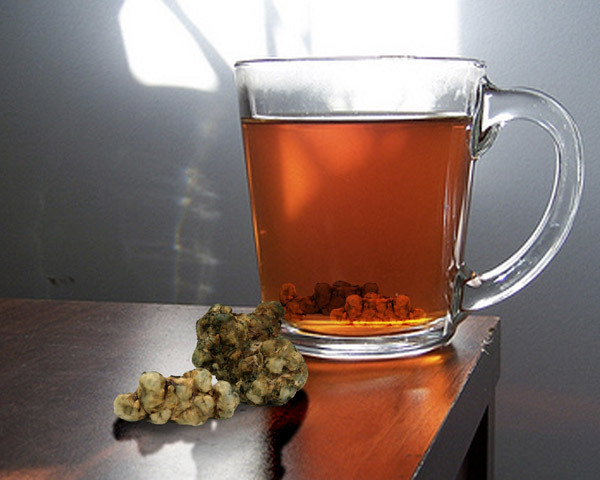 There are also other ways to ingest truffles; by making tea for example. Cook a pan of water, then allow it to cool while cutting the truffles into small pieces. Add the truffles to the water and reheat the water again. Don’t allow the water to come to the boil, because that will destroy the active substances. Leave the truffles in the water for 15 minutes, and add flavour using sugar or honey. In my free e-book, there’s lots of information regarding taking magic truffles and shrooms. There are also many recipes and there is advice provided regarding the consumption of these fantastic natural products. Make sure you download it via this link. Taking magic truffles is quite an experience, and not something you should do unprepared. Here, I provide a brief overview of the most important factors to consider and I strongly advise you to read my complete magic truffle trip guide. In this guide, step-by-step, I explain what you need to pay attention to and what you can do if things don’t go as planned. Firstly, it is important that you feel well before taking magic truffles or shrooms. It can strengthen your mood, so don’t take them if you feel depressed, aggressive or sad, for example. Don’t combine them with other drugs or alcohol, particularly if you’re a novice tripper. Secondly, your surroundings are very important. I strongly advise everybody to trip at home the first few times. This is a very safe and trusted environment in which you have complete control. You decide whether you want to listen to music or whether the television is switched on. You have access to food and drink and it is always very nice to lie down during your trip, which is a little odd to do if you’re out on the street. Thirdly, you should have someone around who’s sober. This particularly applies to new users. You see, hear and feel things that aren’t real, and that can be quite confusing. It is pleasant to have someone to talk to and someone who can comfort you. If things become scary, this person can also take you out of your trip and calm you down. I’ll say it again: please read my magic truffle trip guide before taking truffles or shrooms. This guide is chock-full of tips, my own experiences and those of fellow trippers and fun suggestions for during tripping. Shrooms are as old as the world. The first depictions of hallucinogenic mushrooms can be found in the Sahara Desert. They are estimated to be around 8000 years old. The idea that the use of hallucinogenic substances was a source of inspiration for these images is not new. Research into these images concluded that hallucinogenic mushrooms were often painted. Psychoactive funguses of the Psilocybe genus have been used for more than 3000 years in Central America. 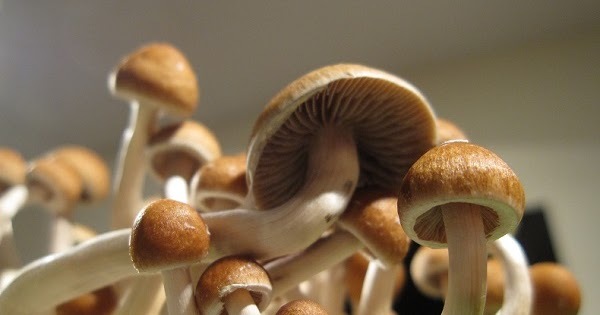 In Mesoamerica (the cultural area consisting of Central Mexico and Nicaragua), holy mushrooms have been used to connect with worlds that are usually outside of our realm of consciousness for as long as people can remember. But, generally speaking, only mushrooms were used for their psychedelic effects, and not magic truffles. 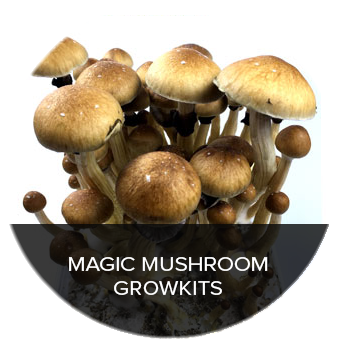 This is because it is much easier to find or grow mushrooms than it is to grow magic truffles. Because they grow under the ground, they are not visible to the naked eye. It also takes a lot longer to grow magic truffles; up to 9 months until they are ready for harvesting. Actually, interest in the magic truffle only really took off when Dutch law forbade the magic mushroom. This law specifically states that only mushrooms containing the substances psilocybin and psilocin are illegal for large-scale growth and trade, thereby excluding the magic truffle. These, therefore, are still legal and freely available. Would you like to read the story of how we started growing magic truffles 10 years ago? Read this article or download my free e-book. If some one wants expert view concerning blogging afterward i propose him/her to pay a visit this website, Keep up the nice work.